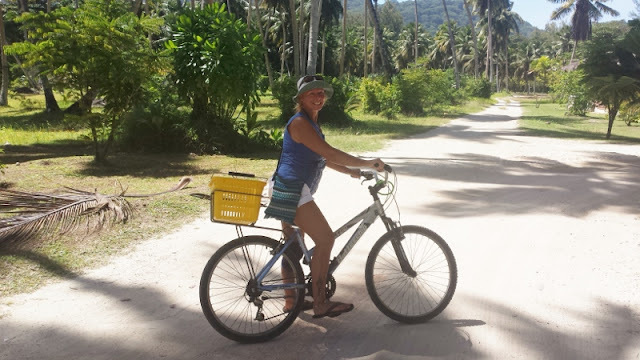 Janice Horton - author of romantic adventure novels: Two weeks spent island hopping in the Seychelles! 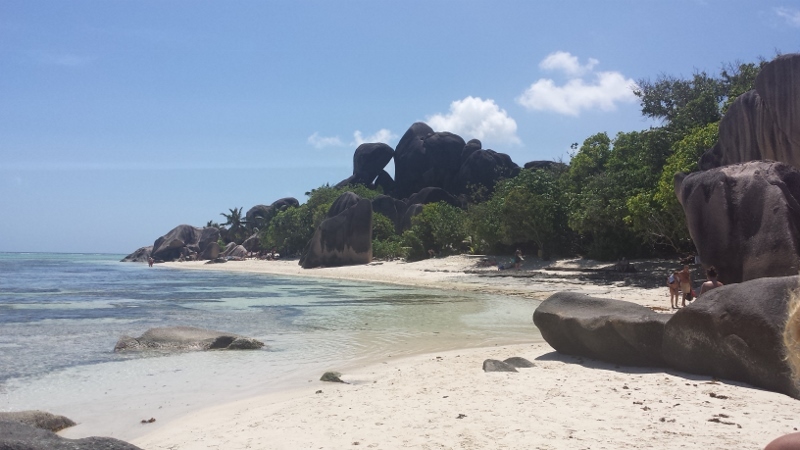 The tropical islands of the Seychelles have long been a dream destination of ours but one we always thought would be outside our travel budget. 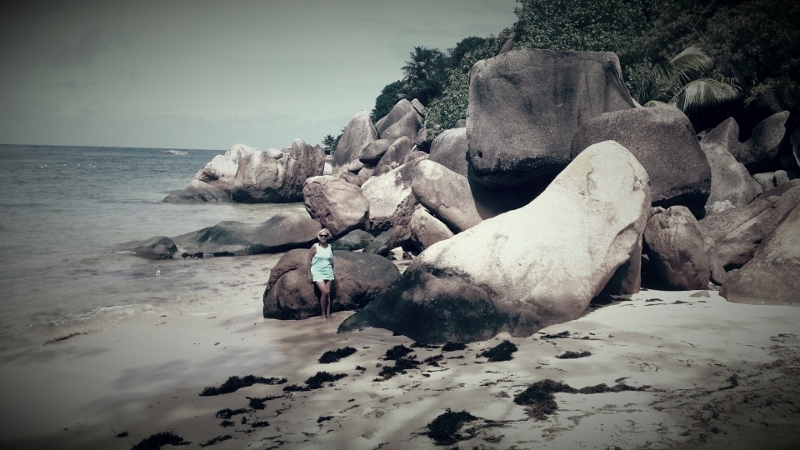 But in the first week of July this year, when we were back in Scotland for the month, and after a week of catching up with our much-missed families, we saw a last minute bargain flying to the Seychelles from Glasgow with Emirate airlines. 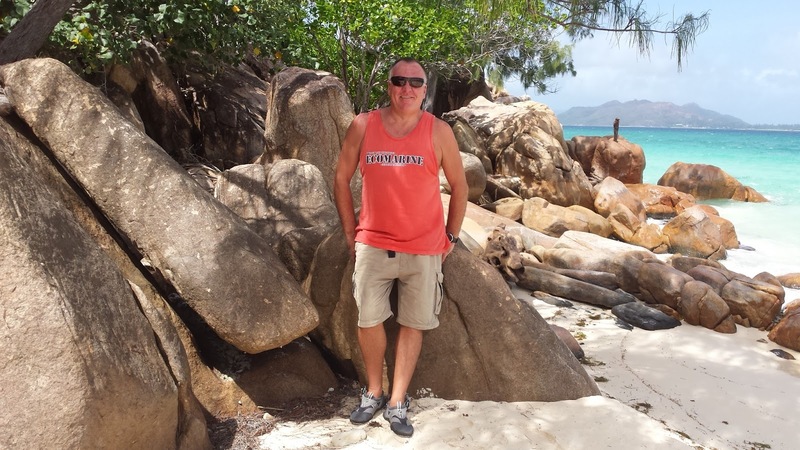 We are subscribed to lots of different airline and travel agency lists and when we were emailed with Emirate’s ‘24 hour flash sale’ – it seemed that a trip to the Seychelles might actually be affordable to us if we acted quickly and made our travel plans independently. It didn’t take us long to agree and press a few buttons! The Seychelles are an archipelago in the Indian Ocean consisting of more than one hundred and fifteen islands that are made up of ancient granite and corals. Famous for its beaches and nature reserves, island hopping is an absolute must and we planned to visit all the main islands of Mahé, Praslin, La Digue, and Curieuse, during our 14 day trip. 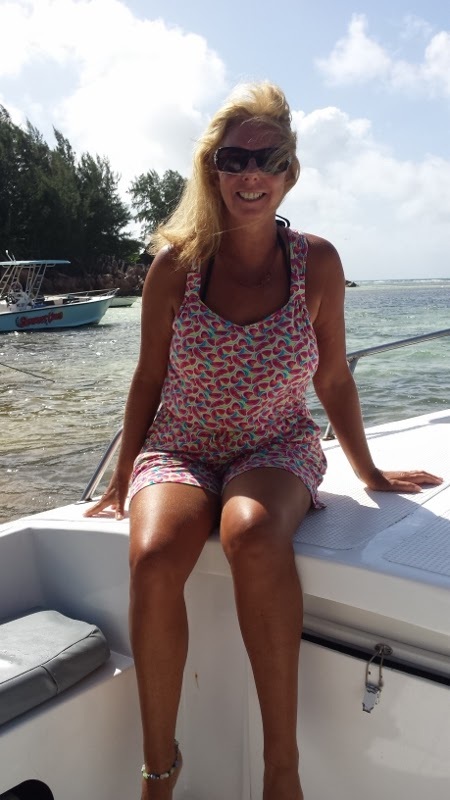 My husband Trav was excited about the scuba diving – the Seychelles are said to be one the world’s top ten dive locations. 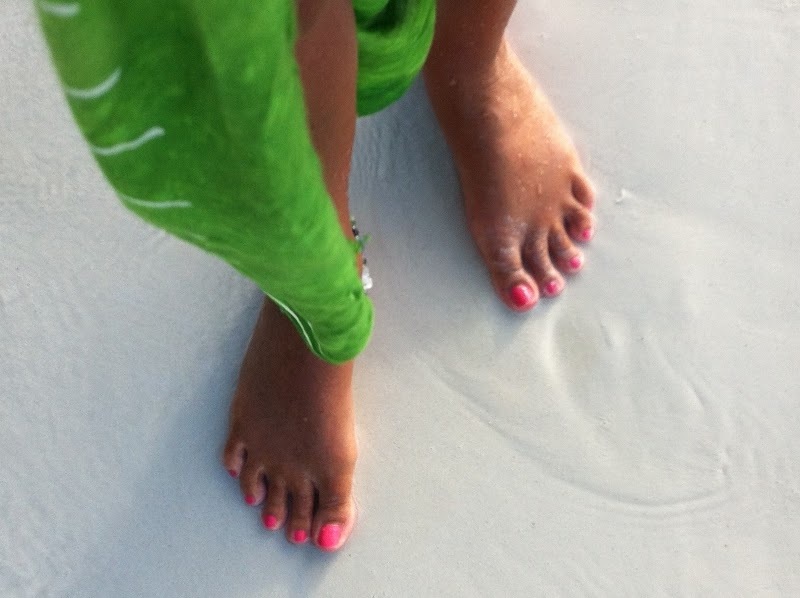 I was excited about seeing some of the most beautiful beaches in the world. 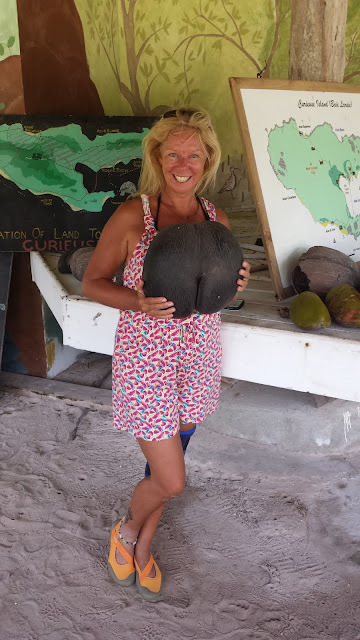 I was also looking forward to seeing the famous ‘coco-de-mer’ nut - the largest coconut in the world that is only found on these islands. 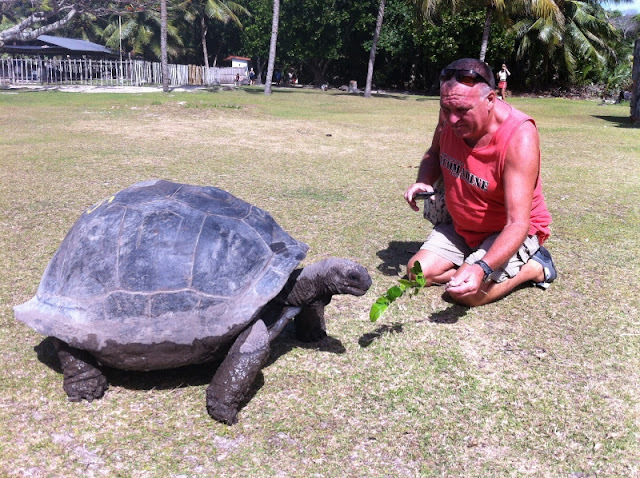 The largest tortoises in the world can also be found here: they have a lifespan of around one hundred and fifty years and the breeding group on the Seychelles remains the only chance to save the species from complete extinction. I was really looking forward to meeting some of these giant gentle creatures. To say that I had huge expectations for this trip was an understatement! We flew out of Glasgow and left the rain and grey skies behind us – heading for Dubai and a change of airplane before flying onto Mahe, the main island. A total flying time of around thirteen hours plus airport waiting time. The view from our room at a Glasgow airport hotel on the morning we flew to the Seychelles! But all the travelling was all totally worth it! We landed in Mahe around 6am and having used several internet travel sites like Expedia, Hotels.com and Booking.com, to find affordable hotels, we took a taxi to our hotel of choice. 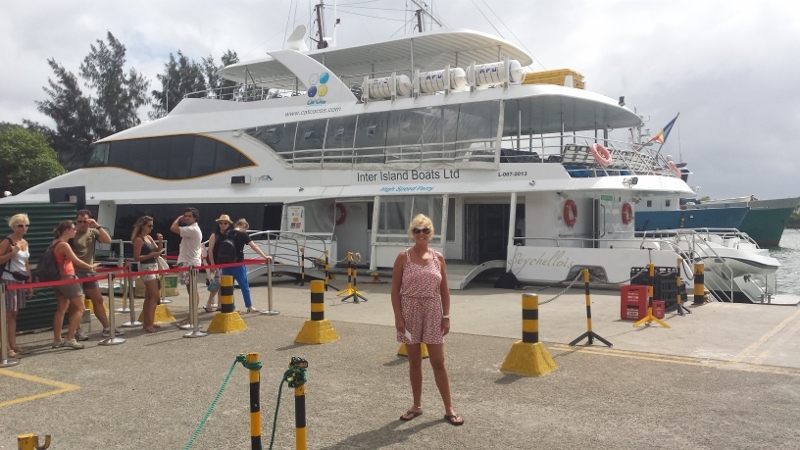 We planned to be on Mahe for our first three nights before taking an inter-island ferry over to Praslin, the island that we would use as a base for a week of island hopping over to Le Digue and Curieuse. 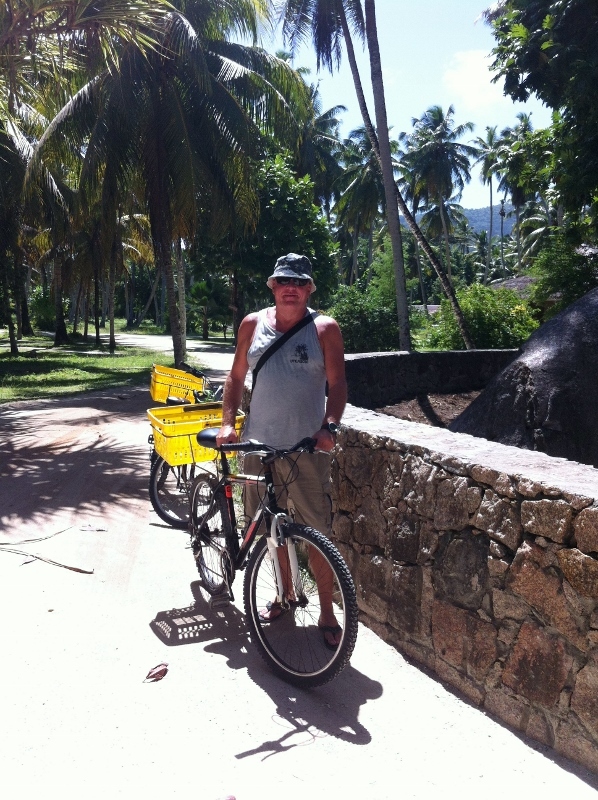 Then we planned to return to Mahe for our last few nights before flying back to Glasgow. These are just some of my favourite photo memories of those amazing two weeks! Once back in Glasgow, on the last weekend of July, we headed up to the university town of St Andrews to attend our good friends daughter’s wedding. St Andrews is also known as the 'home' of golf course, of course. 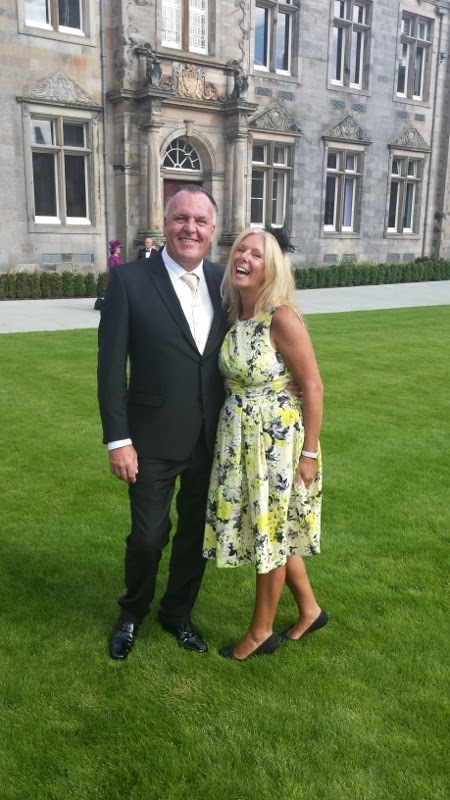 We were thrilled to be invited to share in such a special day and also excited to be meeting up with friends and to be staying overnight in such fabulous surroundings. Trav and I don’t actually carry ‘best clothes’ in our suitcases while we are travelling, so we had to first head to Princes Street, Edinburgh, where I bought a lovely summery dress from Monsoon (half price in the sale - yay!) and Trav hired a very nice suit from a menswear department. On Princes Street, Edinburgh, shopping for our St Andrews wedding attire! 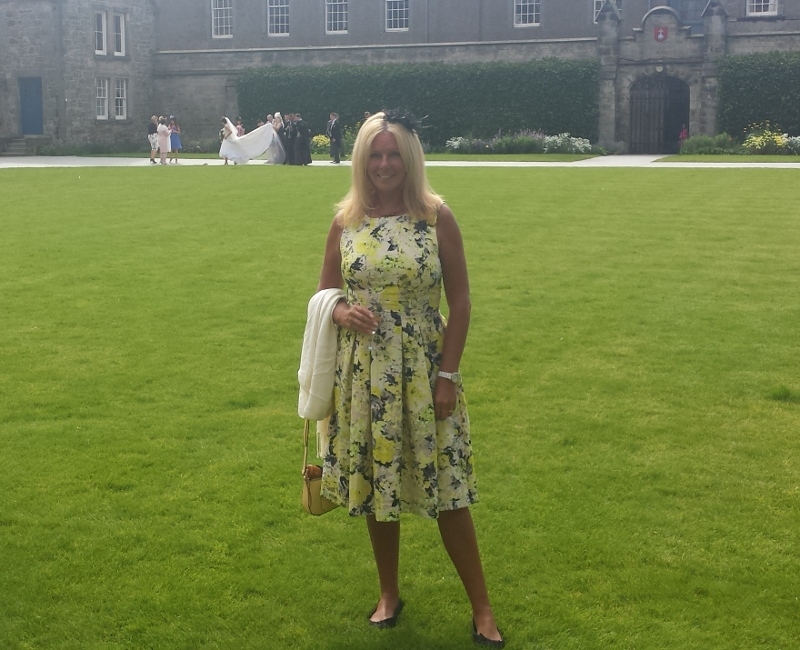 The weather on the Saturday, for the wedding, having started out a bit grey and rainy, brightened up beautifully as we came out of the chapel and the sun came out just as we all enjoyed having champagne and nibbles outside on the famous grass quadrangle. 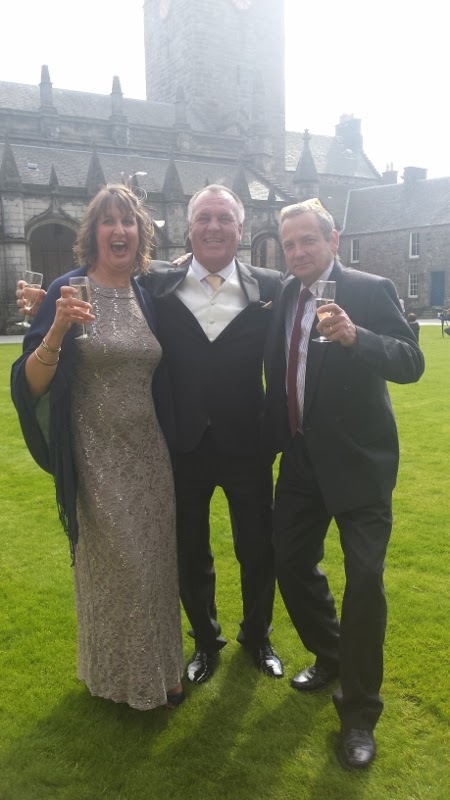 While a string quartet was playing, and the wedding party were having the official photographs taken, we got to chat with our lovely much-missed friends and take lots of photographs. It was a fabulous day. 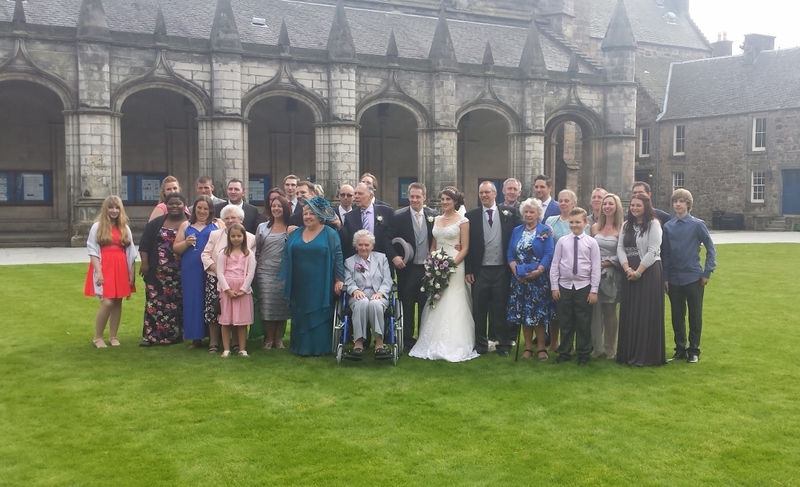 Congratulations to the bride and groom, Leanne and Danny! 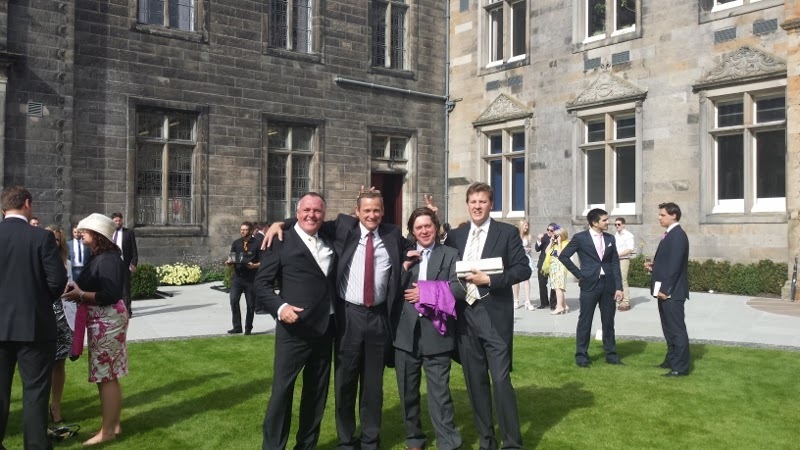 The day after the wedding, we drove back to Edinburgh, handed over Trav’s hired suit and stayed overnight at our eldest son Ben’s apartment in Edinburgh. In the morning, we planned to be up early to travel to Glasgow with Ben where we would meet our youngest son Iain. We were all traveling together to South Korea to visit our middle son James, his lovely wife Sujeong, and our baby grandson Aaron – whom none of us had yet met! We were also meeting Sujeong’s family for the first time and I was worried how we would communicate, as they don’t speak any English and we don’t speak any Korean. But I needn’t have worried - as we had an interpreter for our words - but the immediate love and warmth between us all needed no interpretation at all. One week wasn’t enough with our Korean family and we now miss them all dreadfully. With our lovely Korean family! So my next blog post will be about of our time, our experiences, and our travels in South Korea. It was wonderful, exciting and emotional trip – and I did get lots of photographs! Thanks for reading my blog and please pop back soon. If you don’t want to miss any future posts please do consider subscribing to my blog. The form is on the side bar. You can, should you wish to hear about any book or writing news, also sign up for my newsletter – I only ever send out one or two a year and so promise not to bombard you. Please also consider leaving me a comment or a question if you have one in the comment box below and I promise to reply from wherever I am in the world and as soon as I get an internet connection! 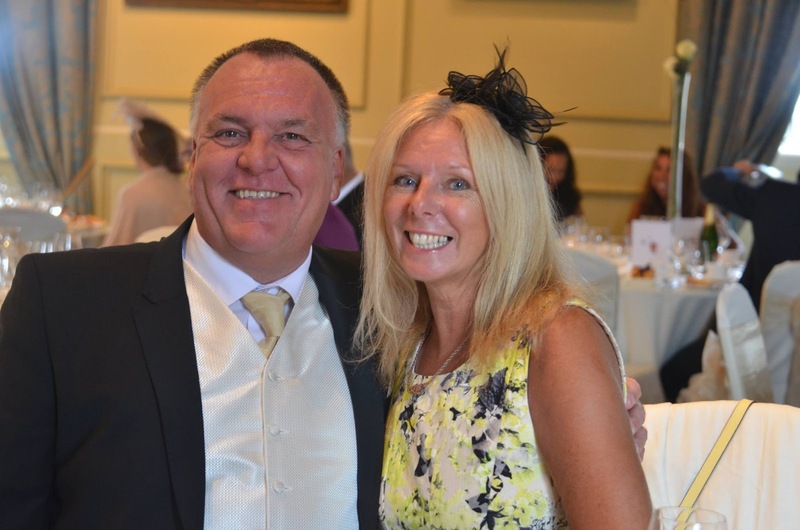 What a fantastic post, Janice and I love the look of your blog. My hubby and I did a similar thing a few years ago. We saw a real bargain to fly to Japan on the new (back then) A380 with Lufthansa (the German British Airways). We had a great time. Really looking forward to hearing about your trip to South Korea. Hi Nicola - thanks so much for your lovely comments. We flew the A380 for the first time recently - what an amazing and very comfortable airplane - I can only imagine what business class must be like! 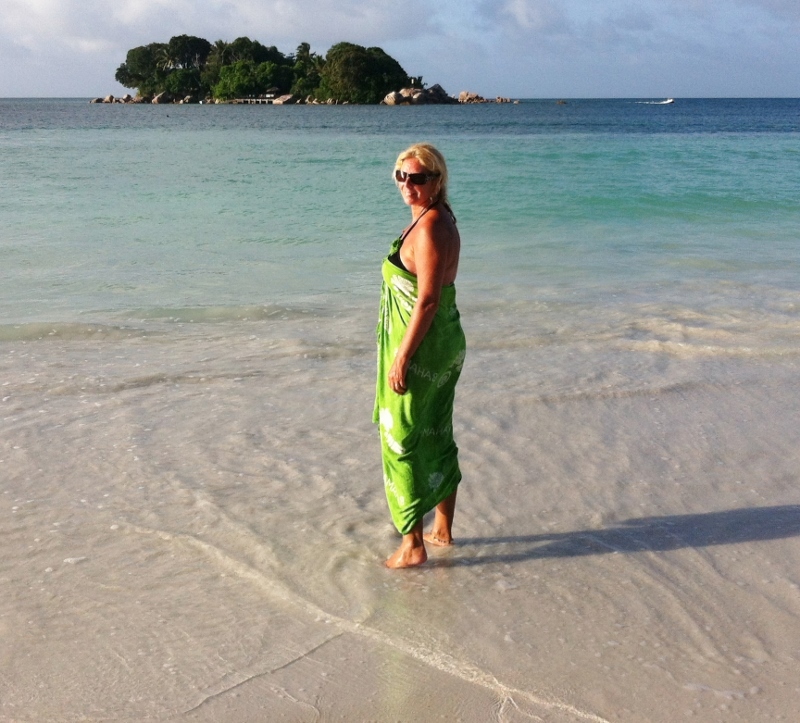 Your trip to Japan sounds fabulous - even more so I feel when it is so impromptu - as our trip to the Seychelles was. I feel very lucky that I can work/write anywhere and now that Trav has retired that we can just pick up and go. I'll be posting about our Korean trip in the next few days. 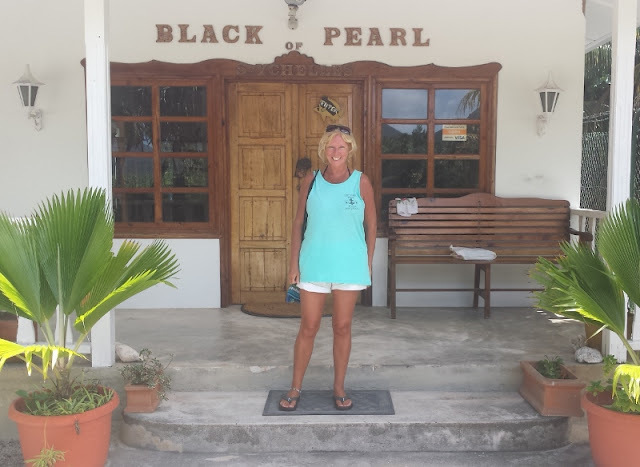 Fabulous post and photos, Janice! 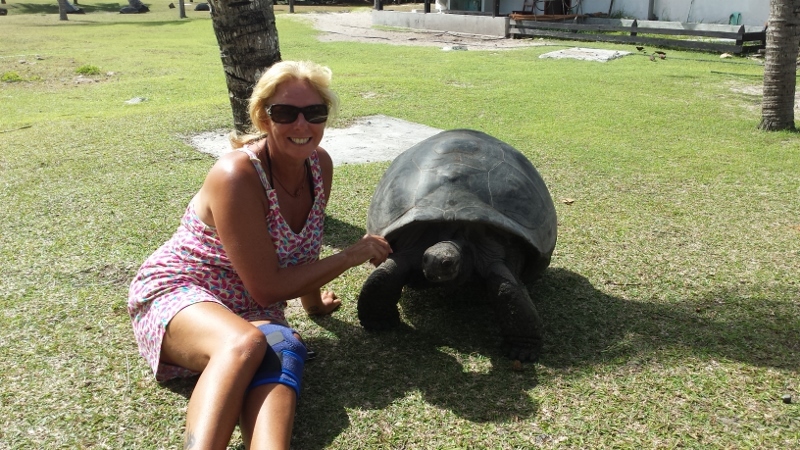 I admire you both so much for all these wonderful adventures and I just love that photo of you and the giant tortoise. How lovely to be all together with your new Korean family. All the best with your next adventure. Hi Rosemary! Thank you and yes, meeting the giant tortoises are my most special and favourite memories of the Seychelles. They live much longer than people and have such lovely eyes - as if they have so much to say, if only they could.... Visiting Korea and meeting our grandson was an incredibly emotional experience and the only way I could leave was to make plans to return for Aaron's first birthday party - which is all part of our next adventure! That said, I will really miss not being in Glasgow or Edinburgh for the WS annual Xmas get together. Please give everyone my love.